Bundle prices are 10% of regular item prices! Displayed price is the total of all items at the average discounted price and weight, NOT final total. Items are weighed then discounted for your final bundle total. 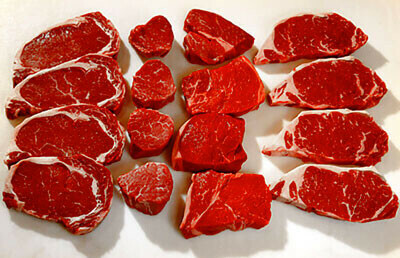 Our Callicrate Beef Steak Bundle is the perfect choice if you're looking for a variety of steak cuts to enjoy. Between the New York strips and top sirloins, to the classic boneless ribeye and filet mignon, this bundle is a field day of steaks filled with hearty, beefy flavor and melt-in-your-mouth tenderness.